Here's something you don't hear everyday, especially from someone involved in the Irish transport industry. "Brexit, we believe, will bring opportunities." The man uttering these words is Glenn Carr, the general manager of Rosslare Europort. It is the second busiest port in the country for 'roll on, roll off' freight. The busiest? Dublin Port. It is estimated that upwards of 85% of all road freight goes through the capital's port. Glenn Carr is eager to point out though that Rosslare port is the closest, geographically speaking, to mainland Europe. In the event of a messy Brexit where there could be customs checks and delays for hauliers driving through Britain, he says Rosslare will be eager to pounce. The idea is to attract some of the freight companies currently using Dublin Port to the southeast. 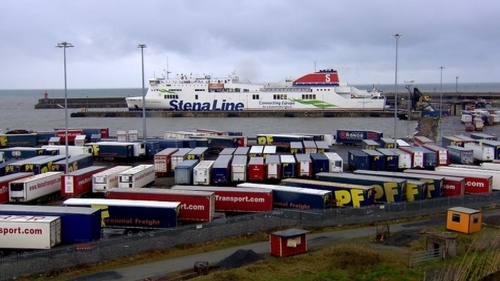 There's plenty of room in Rosslare too - currently it's operating at just 38% capacity. Glenn Carr says he trying to get the word out that his port is "easy to get to, easy to get into and easy to get out of". He says Rosslare is well positioned to provide a real alternative for the haulage industry and more trucks could potentially mean more sailings and more business. We meet Glenn Carr just as the 4.15pm Cherbourg sailing arrived into port. Fifteen minutes later, out rolls the cargo, 56 passenger cars, and 60 freight trucks. Last year, around 900,000 passengers and 120,000 trucks passed through, and many believe that the facility is being under-utilised. Sailing from Rosslare into Cherbourg takes 17 hours. Direct from Dublin to the same French port takes 20 hours. However, leaving Dublin, heading to Calais and using the landbridge (i.e. travelling through Britain by road) is quicker, taking around 12 hours. But after Brexit, who knows? Others who use Rosslare port every day are more sceptical as to whether the port will benefit from a Brexit bounce. Damien Roche, from Roche Logistics, has been operating in the area for decades. He says the notion of attracting hauliers down from Dublin Port has been knocking around since the mid-1970s. Standing in his vast warehouse, as another one of his trucks is being loaded, he says the port has been neglected for years and has been the victim of under-investment. "It's now trying play catch-up," he says. He says the port doesn't have necessary facilities or infrastructure to properly benefit from Brexit and questions whether it's even ready for the UK departure itself. "It's well behind where it needs to be," he said. But officials at Rosslare Europort are keen to point out that change is happening. New Revenue workers are already on site. Irish Rail, which operates the port, has announced a €25m investment over five years. The port has also been designated one of the the State's border inspection posts. Plans have now been made for a new customs-checking facility on its grounds. The problem is, that will not be ready for around two years. In the meantime, work has commenced on a temporary facility that is located around 1.5km outside the port facility. It's clear the surrounding area needs a lift. The decision by Irish Ferries not to run its Rosslare to France route this summer was seen as a hammer blow. Alan Murphy, the manager of the local SuperValu, is also on a committee trying to inject new life into Rosslare Harbour. "We used to have four hotels here, now we just have one," he said. Standing outside one of the derelict buildings, he said the area has been struggling for years and never really recovered from the recession. He welcomes the promised investment, but is eager to see it secured and spent. If there's one area that could do with a Brexit bounce, it's Rosslare Harbour.